Tonight I’m donating a drawing apiece to two auctions going on around town, both of them for very good causes. At TrimTab Brewing Company from 6 to 9 there’s a Beer Tasting and Silent Auction Benefiting the Public Interest Institute. 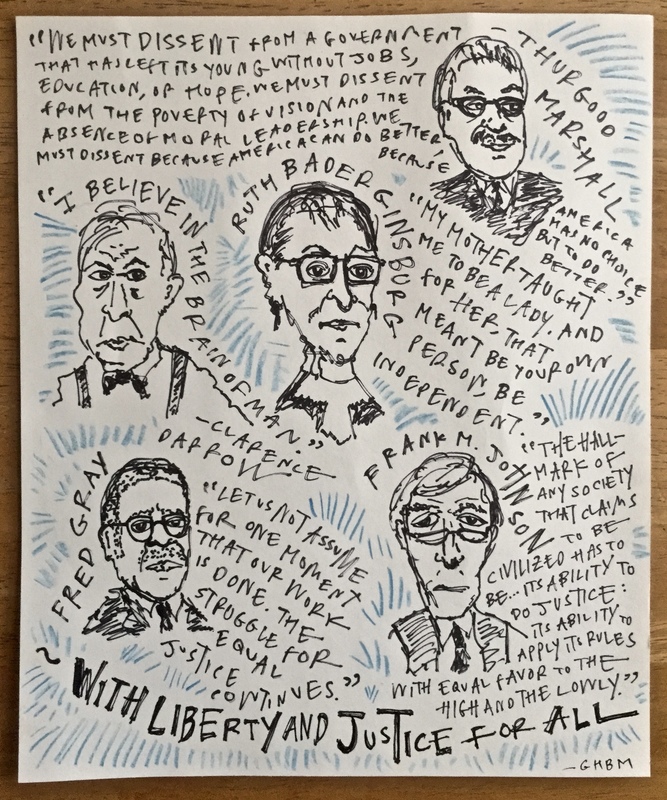 This institute sends UA law students on summer internships with nonprofits and government orgs committed to social justice and the public good; tonight’s fundraiser directly supports participating students, since the gigs are unpaid. The students are doing important and inspiring work; in the past they’ve spent their summers with groups like the Alabama Disabilities Advocacy Program, the Southern Poverty Law Center, the Alabama Appleseed Center for Law and Justice, the Environmental Protection Agency, the Department of Justice, Alabama Possible, and the Foundation for Human Rights Initiative in Kampala, Uganda. Tonight’s fundraiser is one of the many important and exciting projects spearheaded by my inspiring wife, Glory. Last night the power went out while I was drawing the next one, so I had to do it by candlelight. I didn’t realize last night that I was mixing black and blue pens in the dark, but now I like the way the two colors came out together. 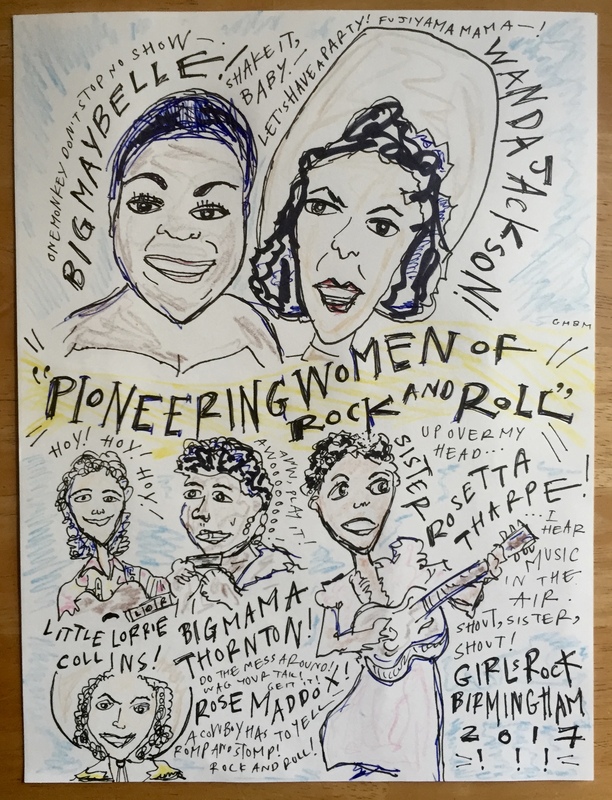 “Pioneering Women of Rock and Roll” is for the Girls Rock Art Auction at Seasick Records and Crestwood Coffee tonight. Girls Rock Birmingham is a great local org. Here’s their exciting mission: “Girls Rock Birmingham helps girls build self-esteem and find their voices through unique programming that combines music education, performance and promotion; empowerment and social justice workshops; positive role models, collaboration and leadership skill building.” You can find out more at www.girlsrockbham.org. To be sure, both events will have greater and hotter auction items than these two modest contributions. And both events will assemble great groups of people for a great good time. You might not even remember you’re supporting a good cause, just by showing up. Finally, I must mention, too, one more incredible event, also happening tonight: an evening performance and art exhibit to benefit the Society for the Arts and Culture of South Asia, featuring Parvathy Baul—singer, painter, musician and storyteller from Bengal. That event is 7-9 at Tres Taylor’s studio in Avondale (right next to Saturn) and is bound to be an inspiring and memorable night. Call Lloyd at 205-317-8983 for more info. Regrettably, none of us can be in three places at once. So let’s spread out tonight and each do our best to support art, social justice, education, and community in Birmingham and around the world. Posted on April 6, 2017 April 6, 2017 by burginmathewsTagged Alabama, Art, Birmingham, Drawing.